The holidays are coming! The holidays are coming! Do some of you want to scream RUNNNN? For many different reasons I am sure. As an RD, a question I get very often is how to keep weight off over the holidays…..literally for me, it’s from Halloween through New Year’s Day! I LOVE TO EAT!!! I tell everyone, that is why I became a dietitian. I didn’t really need to know how to eat well, I just love food!! And lots of time, I fall off the wagon because I have a TERRIBLE sweet tooth…..like sometimes I’d rather have dessert than the meal. But, moderation is key, and as long as I’m not JUST eating dessert 24/7, I think I’m ok (at least I tell myself that)! Anyway, I really do love the holidays. I love having some time off from work, spending quality time with my family and friends, and of course, the food!!! Some people say that you can’t have all of that fun, without putting on the extra pounds. On average, Americans sometimes gain between 1-3 pounds over the holidays. This doesn’t seem like much, but it can add up if you are trying to lose weight, or to keep the pounds off. 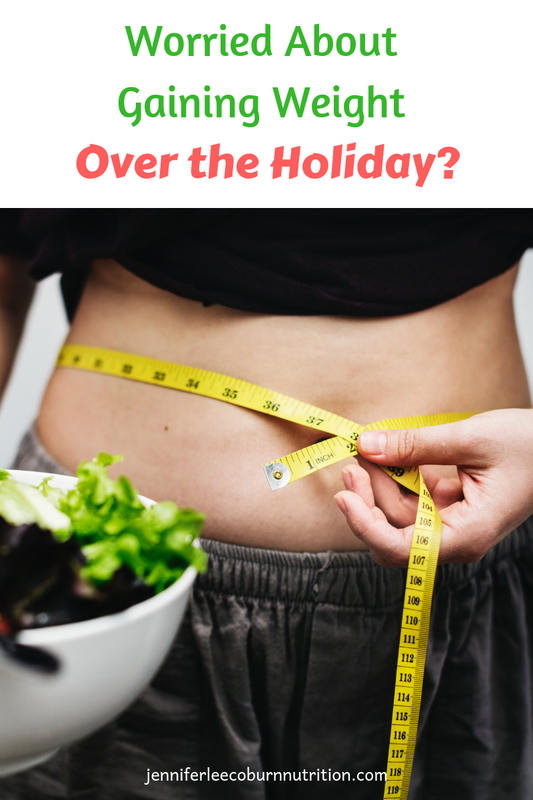 Here are some tips I have, to help you avoid overeating, and to avoid putting on those extra pounds, while still enjoying the family, friends AND food! Don’t arrive to a party/dinner/event on an empty stomach!! Whatever you do, don’t head out to a day or night of fun on an empty stomach. This is definitely a holiday recipe for disaster. Do you ever go to the grocery store on an empty stomach?? ?.....point made, you generally walk out with the two things you went in for, and 25 other things you don’t need! Try to have a snack before you go out. This can prevent you from “binge eating” or eating more than you normally would. Try to avoid overdoing on the alcohol. I know lots of people think they can’t have fun without drinking alcohol, but you can, and it will save you a TON of empty calories. Alcohol has lots of calories, and hardly any nutrients at all. Save your calories (and maybe some embarrassing moments later) for the main meal, and not in the form of empty calories of alcohol. Bring a healthy dish to a gathering. Think about it, if you bring a healthy dish to gatherings, this will provide you with a definite healthy menu option to choose from. You know what’s in it and you know its nutritional value ahead of time. AND, your generosity will be appreciated by the host/hostess for contributing to the occasion. Use a small plate and select small portions. If you choose a small plate, you will surely have to choose smaller portions. Moderation is important, and smaller portions allow you to enjoy a taste of everything. Think about the people and not the food! After a big dinner, take a walk. I know that seems daunting, I’m not talking about speed walking! Any exercise is better than none at all, so even a stroll or walking the dog would be beneficial. Or heck, in my family, there are so many people, if you help with the dishes and help pick up the tables, it is exercise in itself!